Unblock external gully drain (Possible solution) Opinions and advice please. Discussion in 'Plumbing and Central Heating' started by MissBuilding1975, 6 Dec 2017. The outdoor garden drain is blocked quite severely with years of fat, oils, grease build etc.. Most likely from the previous owner of the home, with the addition to my own. The problem started as I noticed my kitchen sink was not allowing water to drain and was coming back up. I change the old trap, u bend and waste pipe. The waste pipe comes out the external garden warn and into the outdoor drain gully grid. I replaced all waste pipes from the sink, all new, but the problem was still happening. I did not notice the water at the time was rising from the outdoor drain until today which then indicated a drain block coming out of the gully grid. I removed the grid and removed a lot of thick fat & grease by hand. Even though I have unblocked the drain a little bit, there is a lot of remnants of fat and grease left which has tucked into the grooves of the drain pipes. I have tried going at this with drain rod, and pressure washer jet washes pipe, though it just will not budge. 1. Will caustic soda actually do the job of unblocking the drains? 3. Because the chemical gets hot when reaction with water, will this in turn damage the underground PVCu Drainage pipe or again will it just cool and wash away. I know the PVCu has high heat resistance though, does the chemical pass the PVCu heat threshold which may then cause damage. If all else fails, then could you guys recommend me a possible home remedy or ideas to just unblock the grease and fat leaving it overnight etc... then wash away. Sorry guys for the many questions, though, I hope you can all help me regarding this. I just want to be sure before putting anything in my drains which may do potential harm. Thank you to all who reply in advance and give opinions on the use of caustic soda and whether it worked for you or not. Does the gully run to a manhole? If it did you might be able to get a jet attachment for your pressure washer or get someone in to jet it clean and catch the fats in the manhole. Hi @Ian H Thanks for your response, yeah the Gully runs to a manhole in our garden which was made for our new extension, which I then assume connects to our original deep manhole. I have attached picture below. Regarding your suggested pressure washing jet attachment, I have tried this yet the fat and grease are soo bad that I am out of ideas. Hence the use of the Caustic soda ? do you have any idea regarding its uses ? or answers to my worries regarding the chemical. Thanks ever much for your reply. 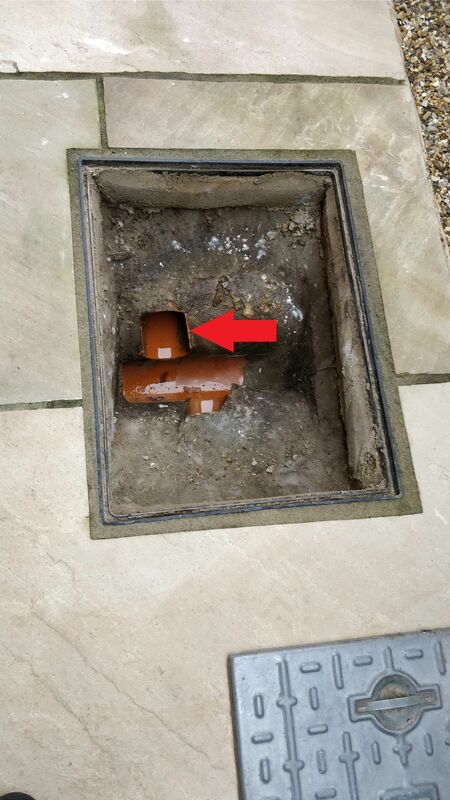 I have attached a photo below of the manhole and drain pipe which is pointed by the red arrow that links to the guy. It's actually this pipe which I tried to use a jet attachment with my pressure washer, I can feel it through its just solid, no concrete or aggregates, just pure thick fat, grease, no luck. let me know anyway and thanks again. Bite the bullet and get someone in to jet it. Household pressure washers will not provide a high enough pressure to remove stubborn fat deposits, it needs a professional drain cleaning company, with a high pressure water jetting gear. Advise you phone round for a fixed price, private companies may be cheaper than Dyno Rob and the other franchises. Also looks to me that the lateral entering the chamber from the bottom of the pic is discharging against direction of flow, does make me wonder if there's an underlying issue with the system, as well as/instead of fat build up being the problem. As above, I go to loads where people have use Jayes Fluid and other stuff and it rarely works. Looking at yours, it's plastic so I wouldn't imagine it would take someone very long to jet it clear. Beware of the cowboys. That man hole is not confirming to many building regulations! Regarding the fat, we had the same, in fact mixed with hair from the shower waste, nice concoction. The solution was just to scoop as much as possible by hand, then leave the rest. There's no need to remove it all as long as you get the majority gone. I did wonder if I could get a kind of giant bottle brush, but the urge to play with the drains passed quickly. After that we started using a fat jar to poor any oil from cooking in. Then when it cold you can just chuck in the bin, simple. How to unblock a cold water pipe after mains tap ? How can I unblock microbore pipes? How to unblock 10mm flow pipes?